A simple and very common technique for preparing a compost pile is called the “lasagna” method; layers of green and brown are alternated and allowed to compost, or decay. The layers provide various nutrients for soil; Green layers provide nitrogen and brown layers provide carbon. Green layers are created from trimmed trees or shrubs or other yard and garden plants. In this example, I used overgrown tomatoes, yaupon holly shrubs, and small oak tree branches. The brown layer consisted mostly of leaves—including those that have fallen naturally as well as from a variety of plant material that has been trimmed, and then taken to the composting area for later processing. If using leaves that have fallen, scrape off the upper layers and leave the fine, broken down brown matter on the ground as nutritional treat for the soil beneath. 1) Either use an existing composting pile or start one with brown materials. 3) Cover the green materials with brown, then add water until the top brown layer is moist, but not overly saturated with water. 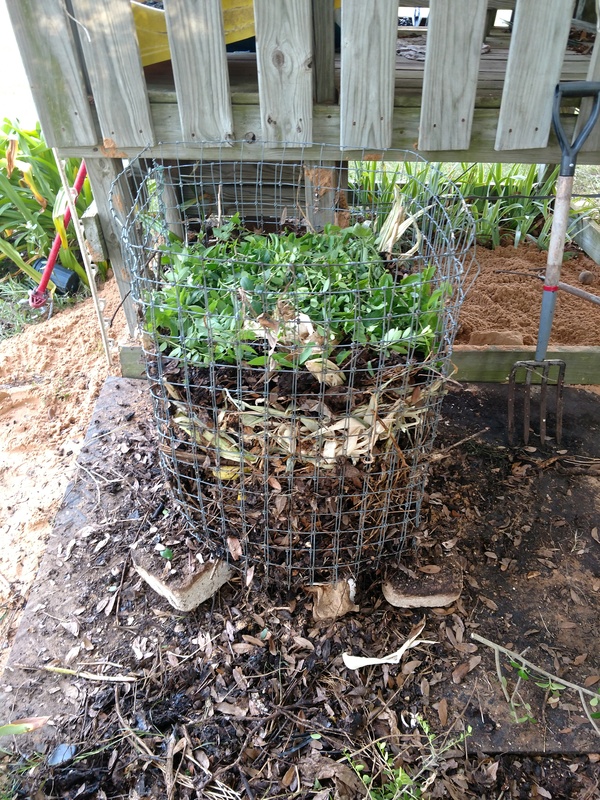 4) In this example, we used leftover horse wire fence, folded in half, to create the compost “bin”. Over time (days to months, depending on temperature and moisture) the height of the materials should settle. The bin (as set up here) can be flipped over to check progress and remove compost, then flipped back to continue breaking down. Compost is fully “ripe” when the plant parts (leaves, sticks, etc) cannot be distinguished; in other words, it appears as a volume of brown, soft, fine organic material with an “earthy” smell. Add compost to the garden each season—place a layer on top and gently work into the soil; then add a layer of mulch to discourage weeds and retain moisture. NOTE: A simple pile on the ground also works, just add layers of brown and green in a pile on the ground add water, and stir occasionally with a turning fork.